The Royal College of Physicians and Surgeons of Glasgow has been collecting books, archive material, artwork, and museum objects since 1698, when we acquired our first home in the Trongate, Glasgow. Today our Heritage collections are varied and extensive, but some gaps do still exist, so we welcome offers of donations to the collections. If you have items you'd like to donate to the College's Heritage collections, the first step is to contact us. 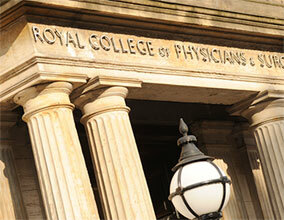 Email (library@rcpsg.ac.uk) or telephone (0141 221 6072) is best. Please supply as much information as you can, and include a photograph if possible. In deciding whether to accept a donation, we'll take a number of factors into consideration. As an accredited museum, it is important that we are able to properly care for and manage the collections in our care. For this reason, we do not collect duplicate material or anything that falls outside our collecting policy. Please don't send items in the post or bring them to the College without contacting us first. The College is not responsible for storing or returning unsolicited donations. Please note that we are unable to provide object valuations, and we don't normally accept items on long-term loan or with specific conditions attached.